I was so excited to see a creature-based reference to Time Spiral‘s Angel’s Grace that I didn’t grasp a lot of the nuances of this card on my first several readings. It is a one-shot effect that is much easier to get around than Worship, but it interacts very strongly with flicker effects. Pairing it with Deadeye Navigator means that you can never lose the game via creature damage, albeit in a very expensive manner. That’s not as good as it sounds in, say, Commander, where it won’t stop you from losing to 21 damage from a single general, but there might be a way to make it work in some casual settings. I also like any ability that works from the graveyard, as there’s something about it that still feels novel and transgressive to me even after all these years. However, ten life is actually not that much of a buffer against the huge end-game creatures we have these days, much less Modern’s efficient burn spells (Hidetsugu’s Second Rite, anyone?). It does trigger any abilities that look for you gaining (or losing) life, but I’m not sure it’s worth including along with those at this cost and roundabout manner of use. Perhaps a lot of decks will look at it as just a 5/4 flying angel with occasional extra effects, and that’s definitely something. The effect of Angel of Grace is remarkably similar to the Time Spiral card Angel’s Grace, at least at first glance: for one turn, you can’t drop below 1 life due to damage. This isn’t a perfect shield: you can still lose life to fall to zero, and it doesn’t keep you from outright losing the game to other state-based actions, but Angel of Grace can sometimes get you the one additional turn you need to try and turn things around. Turning the enemy’s alpha strike around and being able to swing back? Sounds pretty nice. A five-mana 5/4 is a bit weird of a body to attach this to, though. 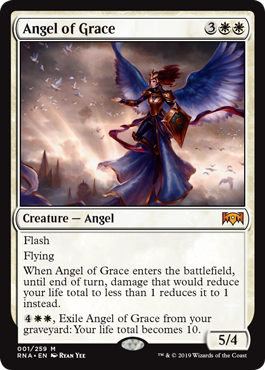 Five mana is pretty well telegraphed, and a lack of combat abilities besides the obligatory flying means that Angel of Grace has most of its power loaded into its comes-into-play trigger. It is a powerful trigger, that said. It has one final trick: set your life total to 10 when it’s in your graveyard as a one-time effect. The obvious synergy is to let Angel of Grace die during what would be a lethal swing, then pop her at the start of your next turn (or when you are about to die). Angel of Grace definitely has some intrigue to her, and I can see her pulling her weight in Constructed…though how much she’ll be able to do is still a bit nebulous.